Swatch Cards…and Why They Need To Be Stopped! 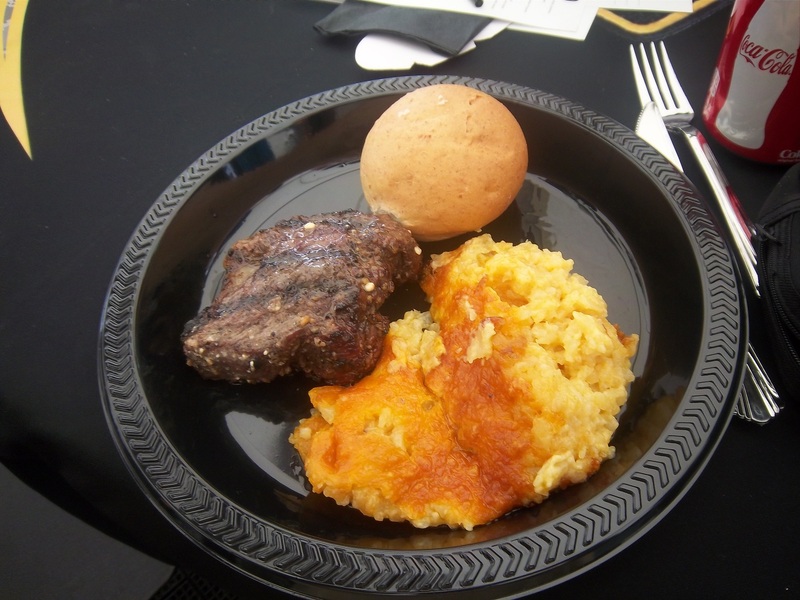 The Midsummer Classic…A Dirty Experiment. 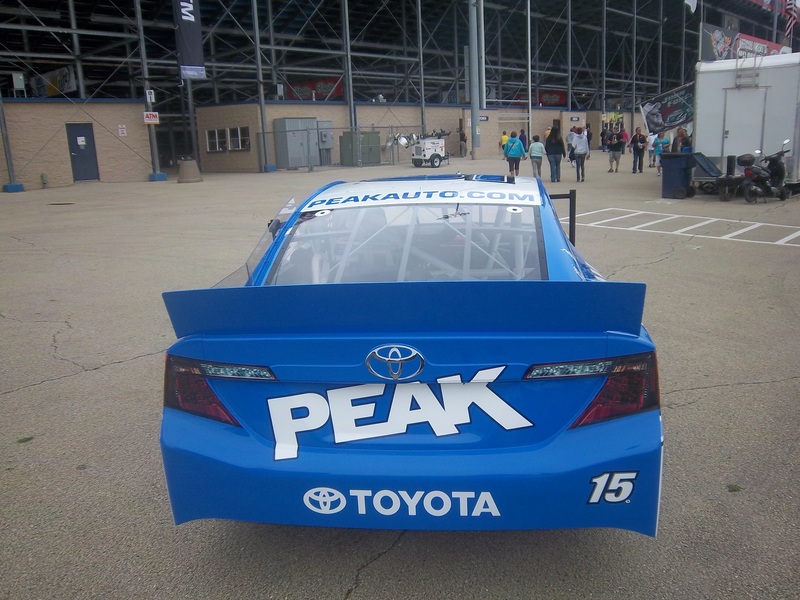 I don’t normally do a midweek column, but a brand new event in NASCAR is taking place tonight. 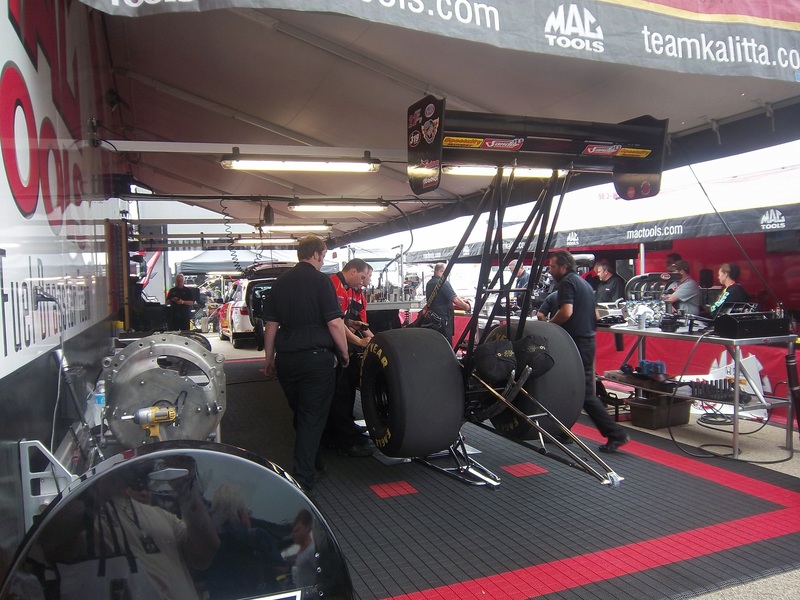 Eldora Speedway in New Weston, Ohio is the site of a new experiment in the NASCAR world. For the first time since 1970, one of NASCAR’s top series, the Camping World Truck Series will race on a dirt oval. Tonight at 8PM EST, 30 of NASCAR’s top drivers including Ryan Newman, Ken Schrader, Kenny Wallace and others will race 150 laps, in 3 different segments on a ½ mile clay track. The dirt surface mandates some unique rule requirements for the race, including the removal of the splitter, and a layer of mesh on the front grill, as seen here. Massive changes to the spoilers are included, as seen here. 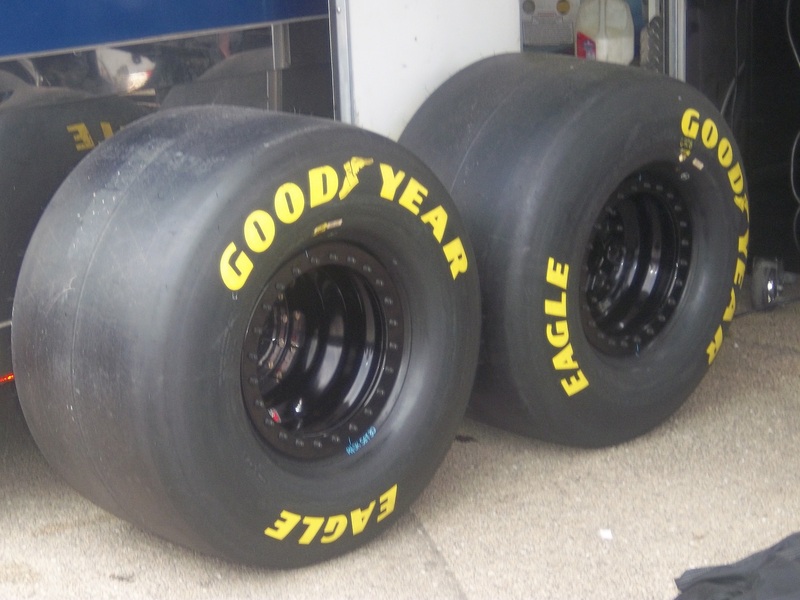 The tires are grooved, and are not as wide as standard Goodyear Wrangers used in the truck series. The most unusual addition to the truck is a “bug deflector” which is designed to deflect stones away from the windshield. This video explains all the changes to the truck for this race. Some things have surprised me about this event. The first thing is that two drivers who I would have expected to try and make the field aren’t attending the race. The first is Kyle Busch. Busch is what I like to call a “pure driver” and what that means is that he is truly happy when he is behind the wheel of a race car. The dirt style of racing I think would suit Kyle very well. The other absent driver that really shocks me is Tony Stewart. Stewart, like Busch is a pure driver, but what makes Tony’s absence from this race perplexing is that HE OWNS ELDORA SPEEDWAY! 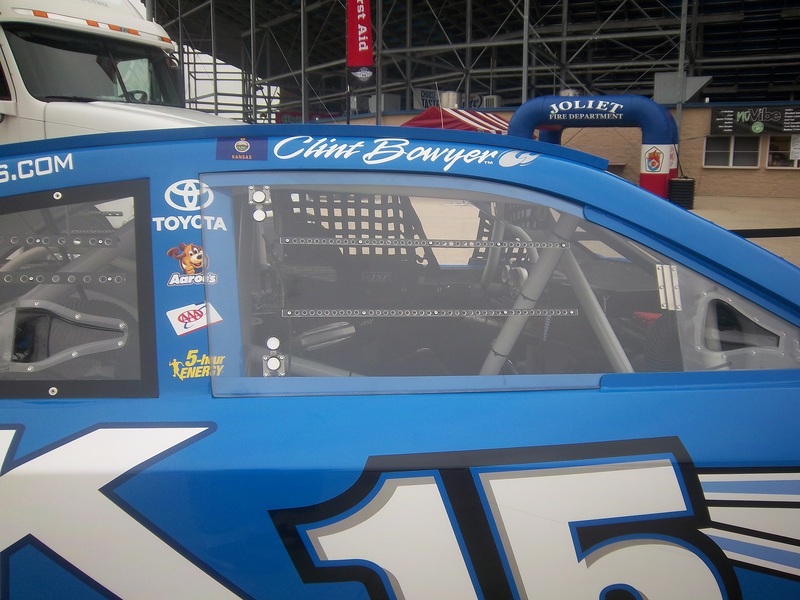 Why Tony Stewart isn’t in this race at a track that he owns is kind of odd. 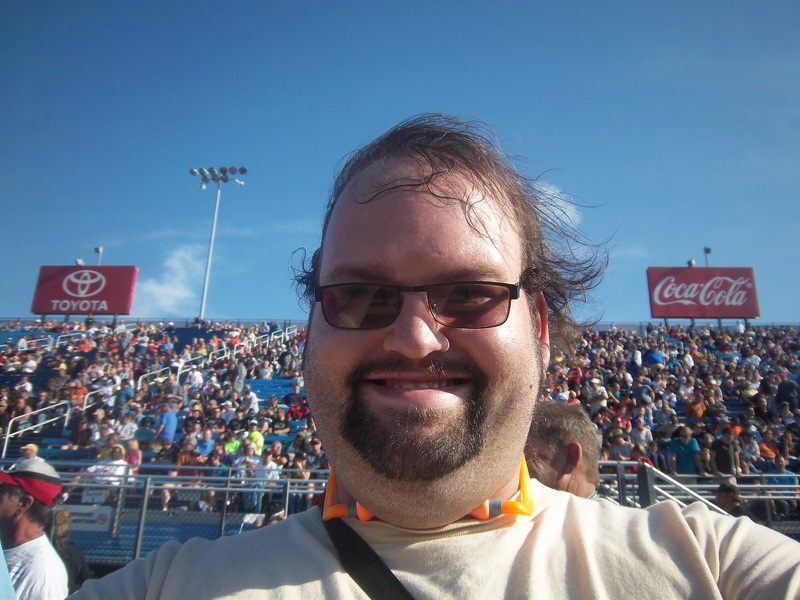 Now even though this is the first dirt-track race featuring on of NASCAR’s top 3 series, I doubt it will be the last. This event is a concept that is a long time coming, and I think it will in the very near future extend to the Nationwide and Sprint Cup series. 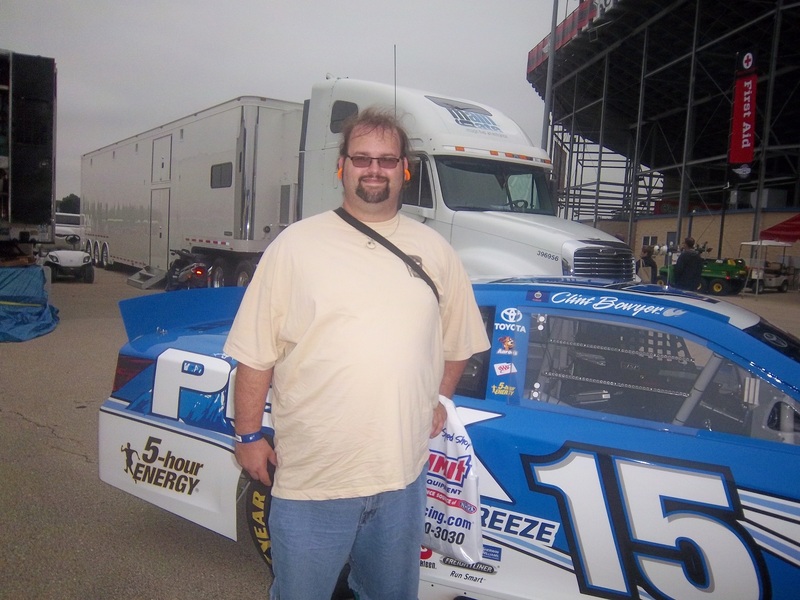 I would honestly love to see a second all-star race on Eldora or another dirt track added to both of NASCAR’s top series, in addition to the truck series. 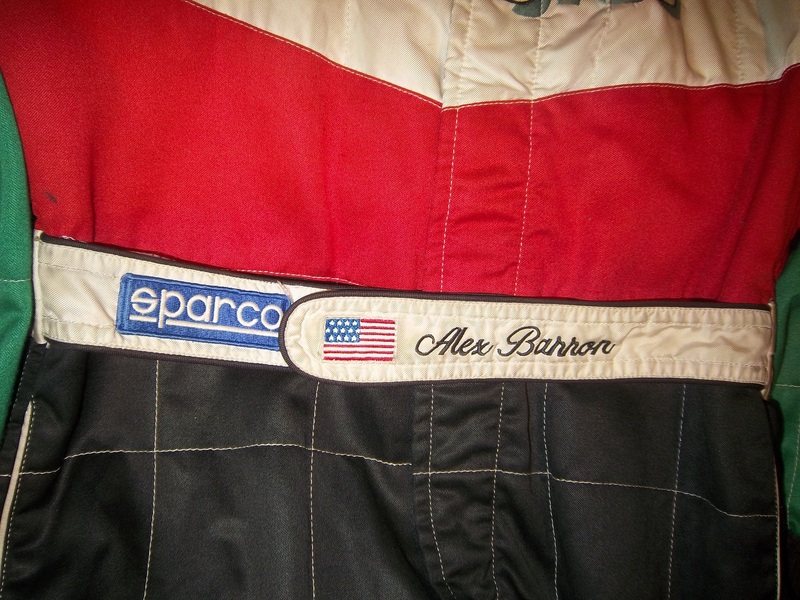 When it comes to driver suits, I normally focus on race-worn items, but this week I’m going to shift gears, and focus on another kind of suit…and yes, pun intended. 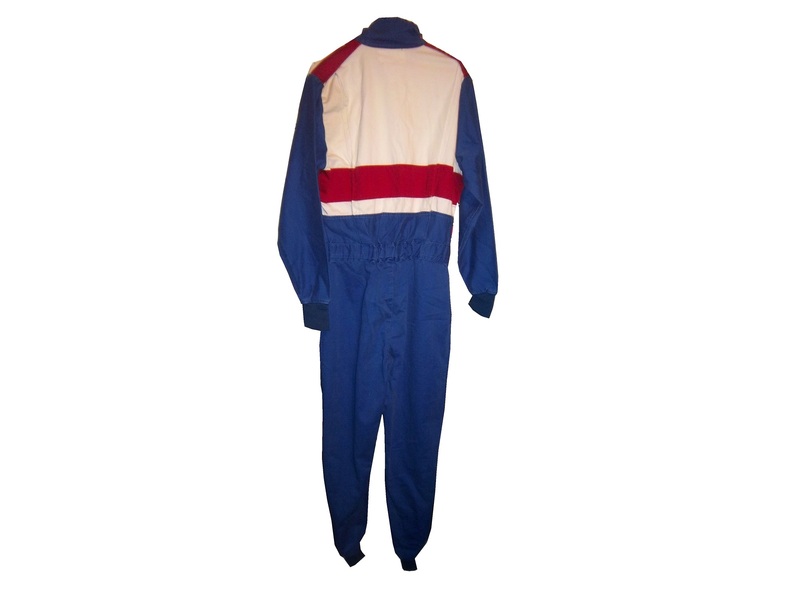 This example is a suit used by the Richard Petty Driving Experience. 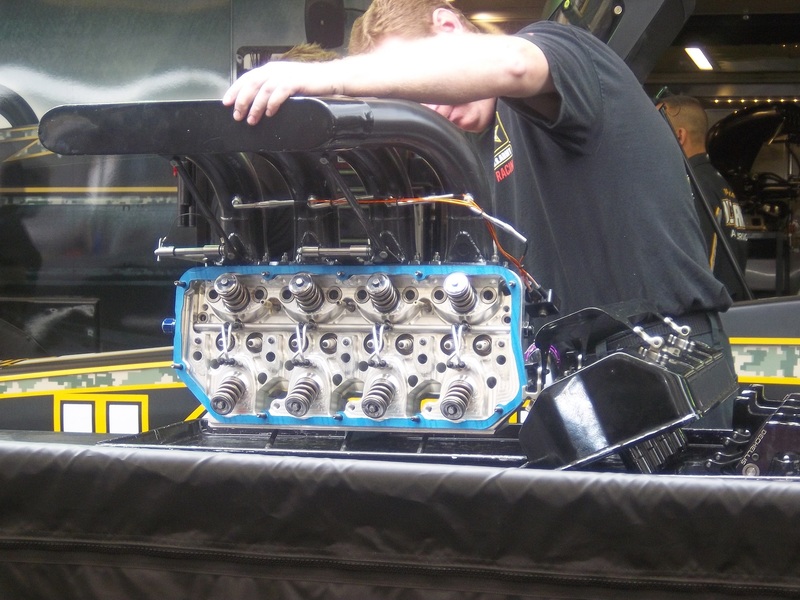 What the RPDE does is give die hard fans the ability to get in a stock car and either be driven around a track for a few laps, or drive the car around the track after some instruction. 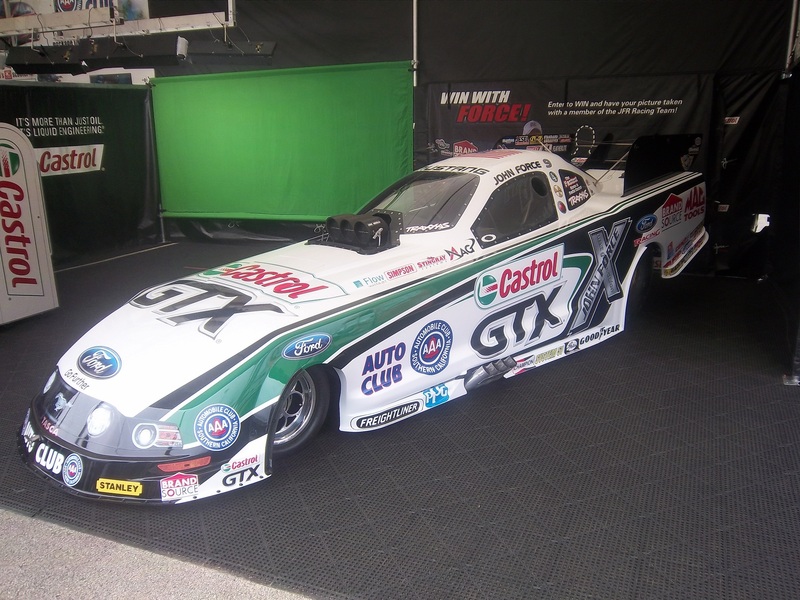 The cars are almost identical to Gen 4 cars, but have two seats and are scaled down to 600 horsepower from the over 800 currently run in NASCAR. 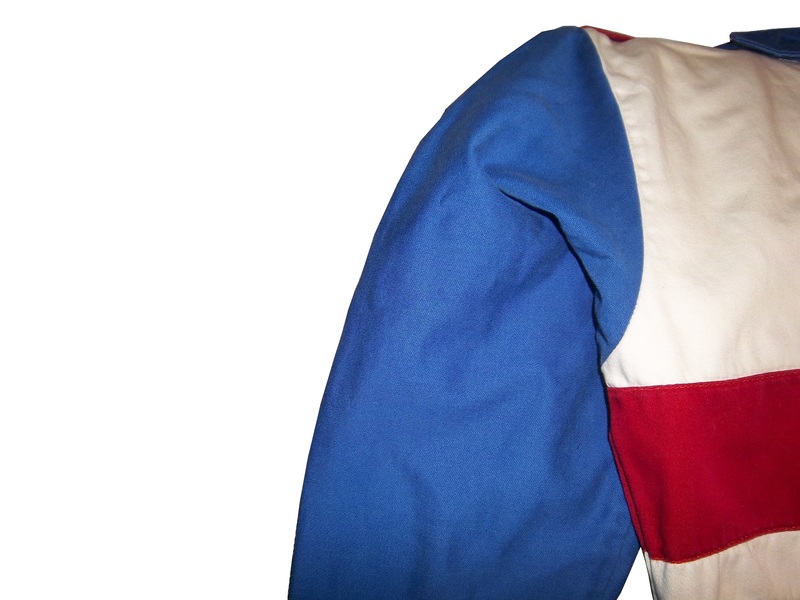 It looks similar in design to suits that Richard Petty wore during his racing days. 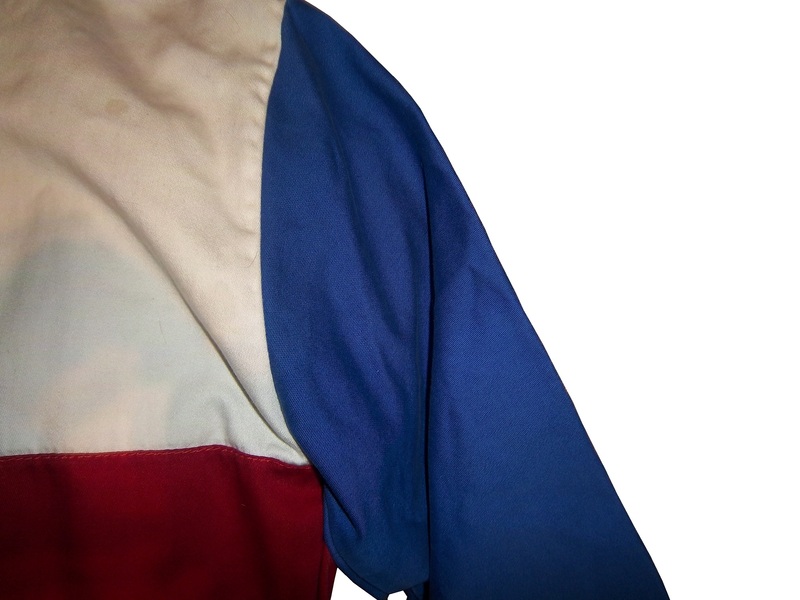 Interestingly, there is no Petty blue, but a darker blue similar to the blue used in STP logos. 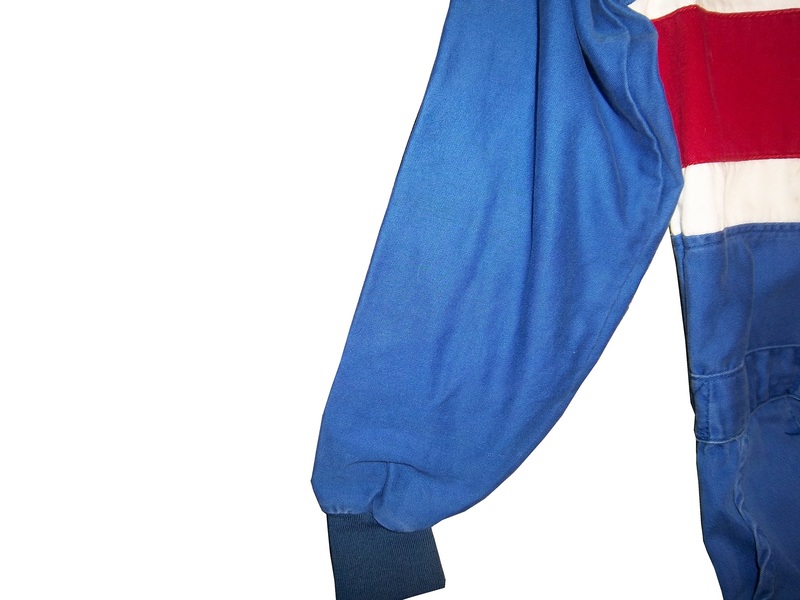 There are no logos of any kind present, not even of the suit manufacturer, a company called Westex. I find it odd that at that time, the Richard Petty Driving Experience logo wasn’t used. There is no indication it was ever present on the suit to begin with. 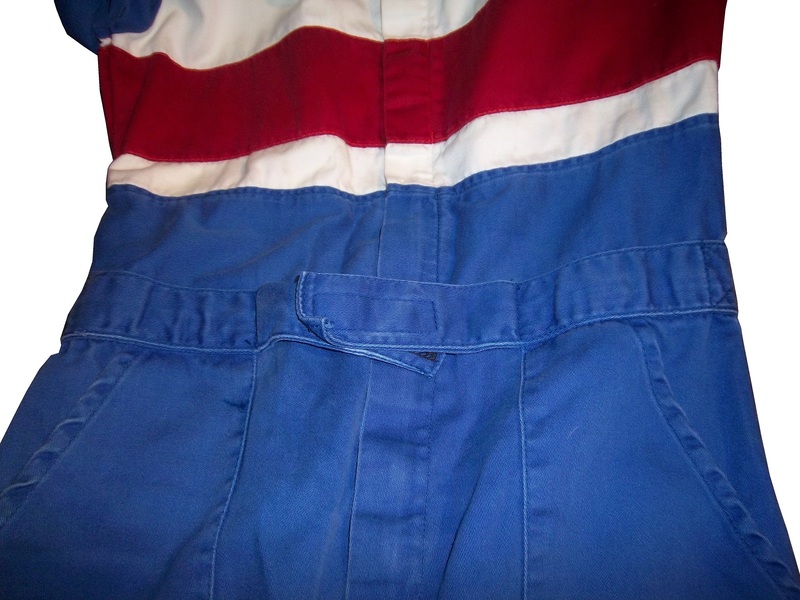 The legs are cuffed, as opposed to the boot cut that most NASCAR drivers like to use. 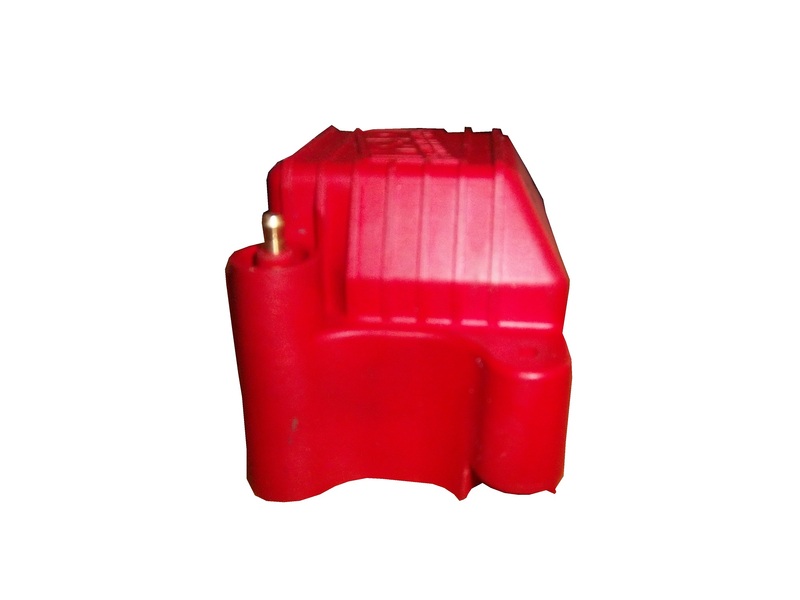 Arm gussets, which give drivers better freedom of movement, are not here either. 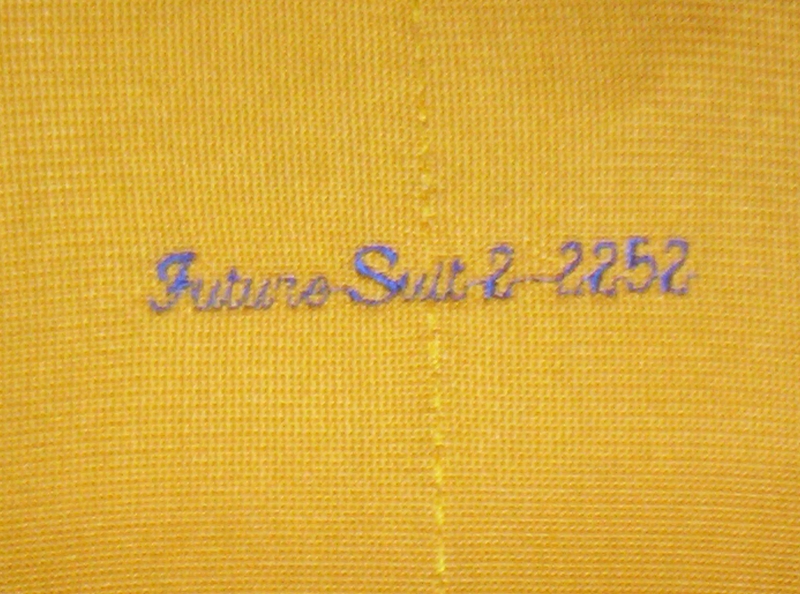 Later suits have some of these features. Now even though the cars are either driven by professionals, or by drivers who have had lessons, the risk of crash and fire is present. 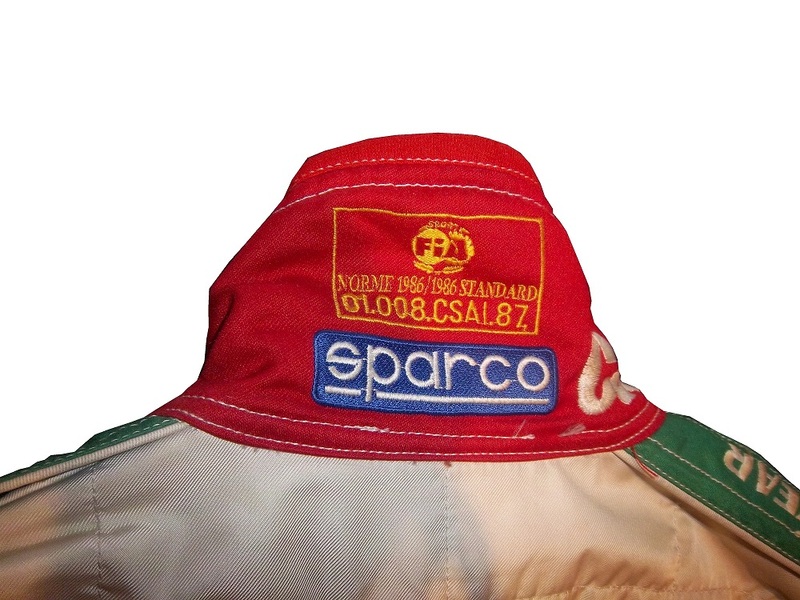 As such, the fans are issued driver suits. 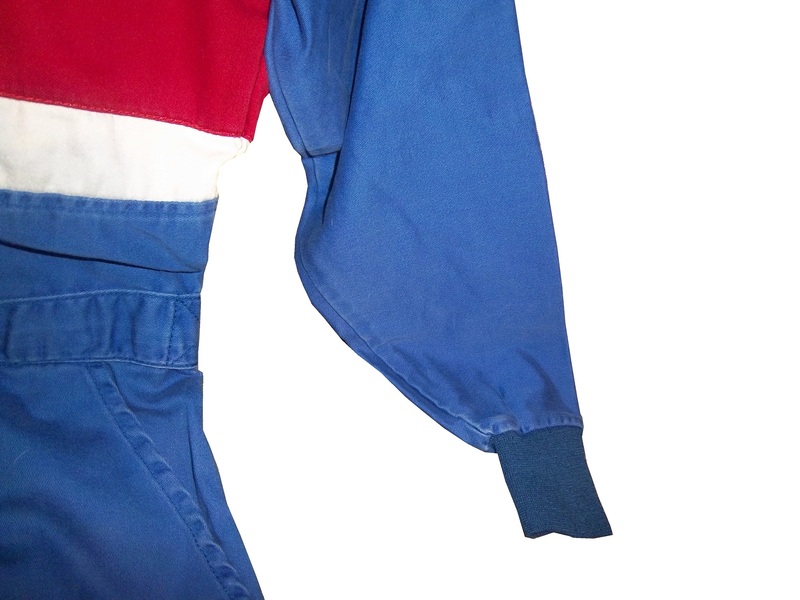 This is an early version of the suit issued to them. What strikes me about this suit is that it is a single-layer suit with no epaulets. 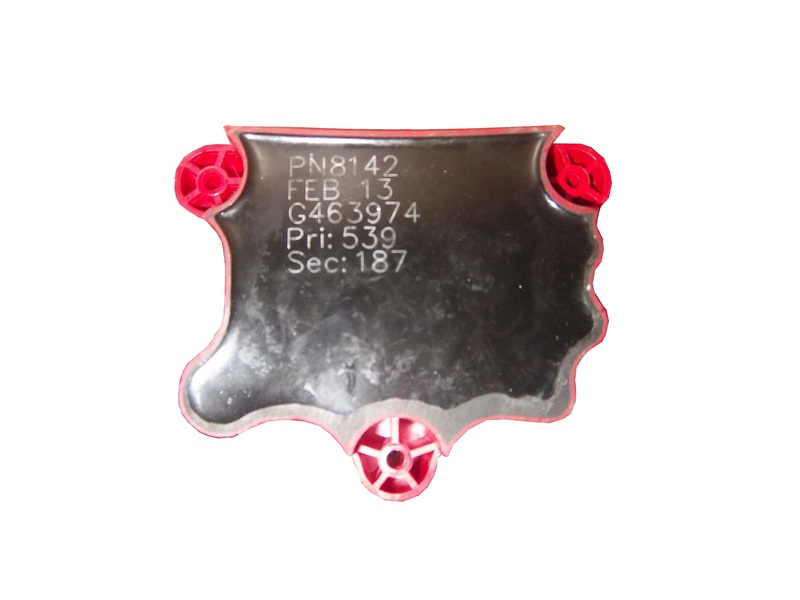 The epaulet is critical here because they are specifically designed for pulling an unconscious driver from a burning car in the event of a wreck. 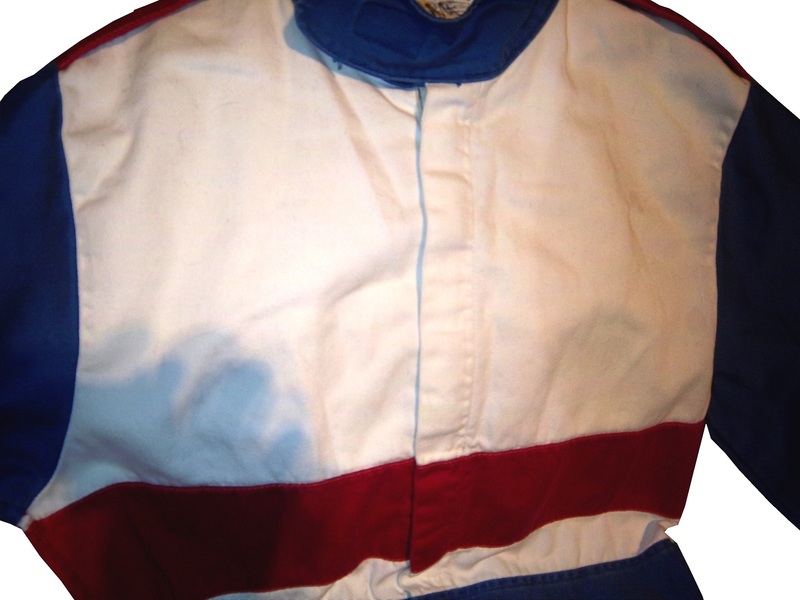 The fact that is is a single-layer suit is an issue here because in racing, redundancy is safety. 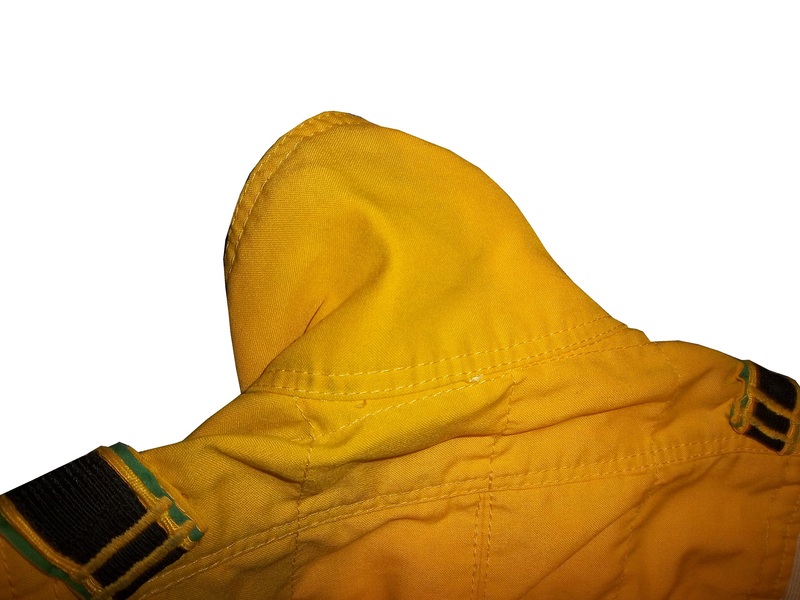 NASCAR drivers wear double or triple-layer suits as well as fireproof long johns that give them 30 seconds of fire protection. I would be shocked if this suit would give 10 seconds. 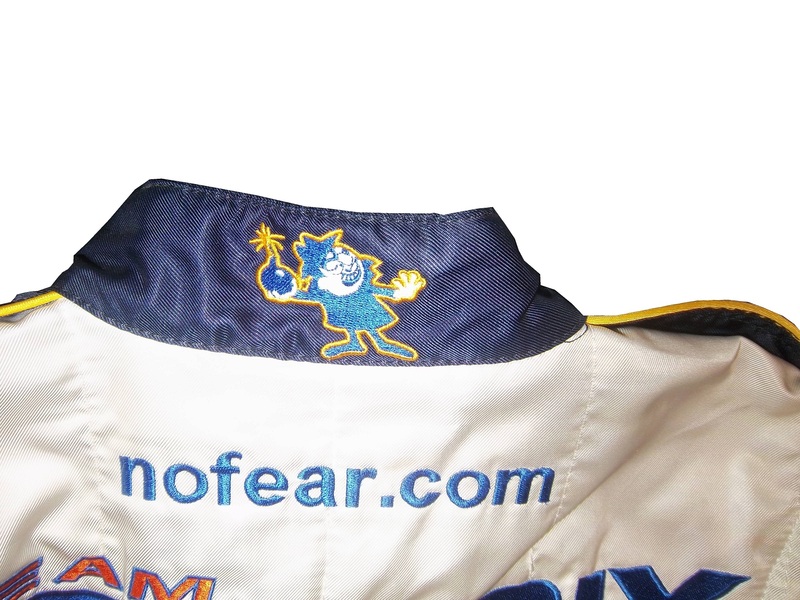 I should also mention at this point that the suit does not have any SFI or FIA certification. When you are driving fans around a track with the ever present risk of fire, having a suit that can withstand the worst case scenario is a plus. 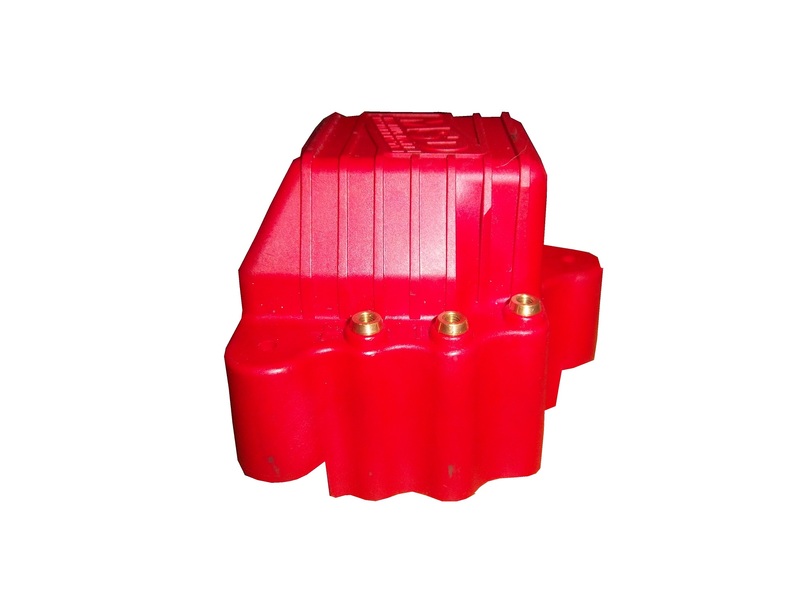 SFI certification is designed to do just that, insure that the person wearing the suit will be able to be protected in the worst case scenario, so I do not get the logic of having uncertified suit for use. All that said, now let’s discuss the basics. 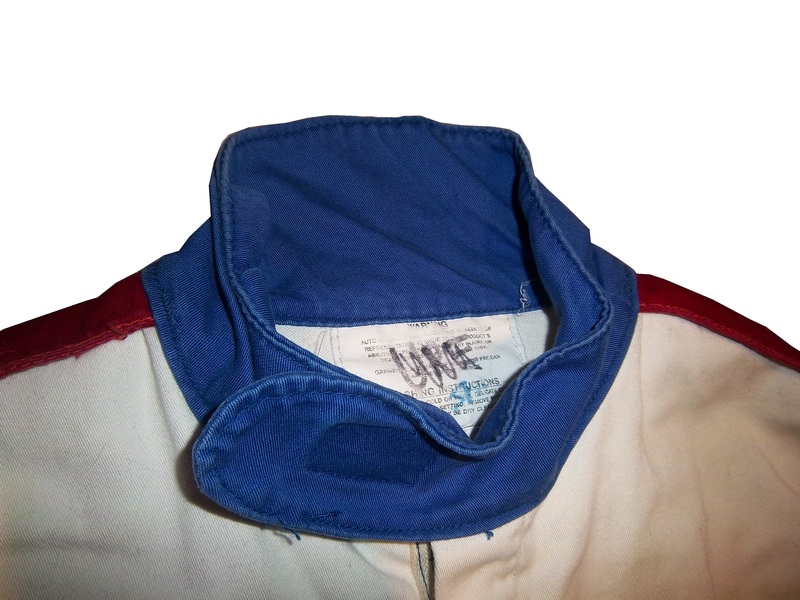 The collar is a Velcro-shut design. 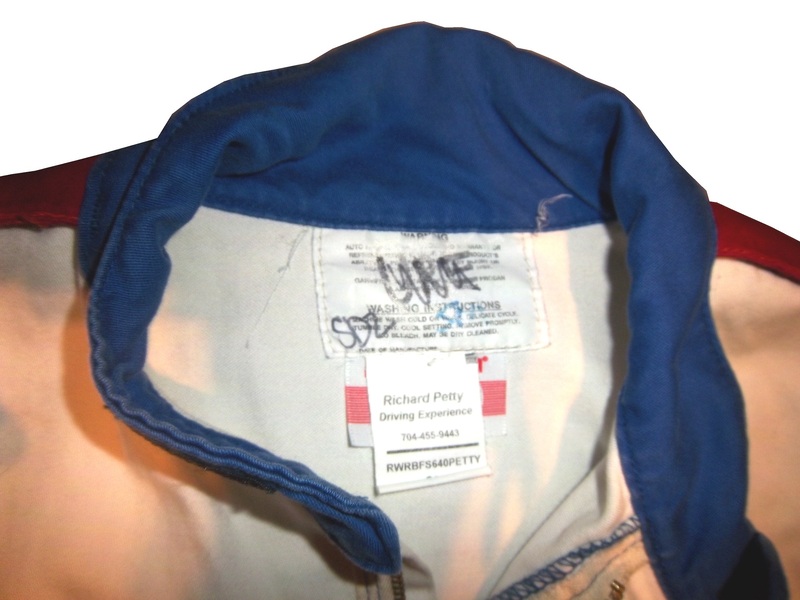 The tag is custom for the RPDE and has some things written and crossed out in Sharpie. 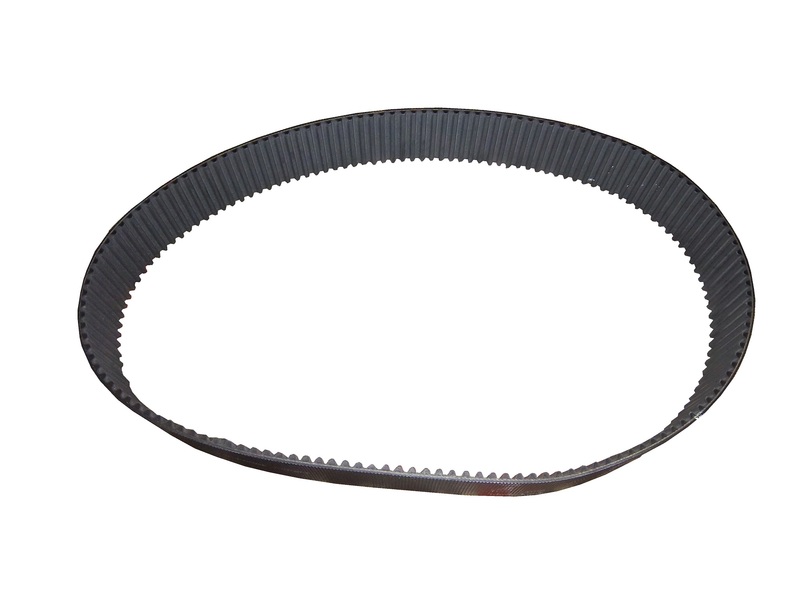 There is an unadorned belt. 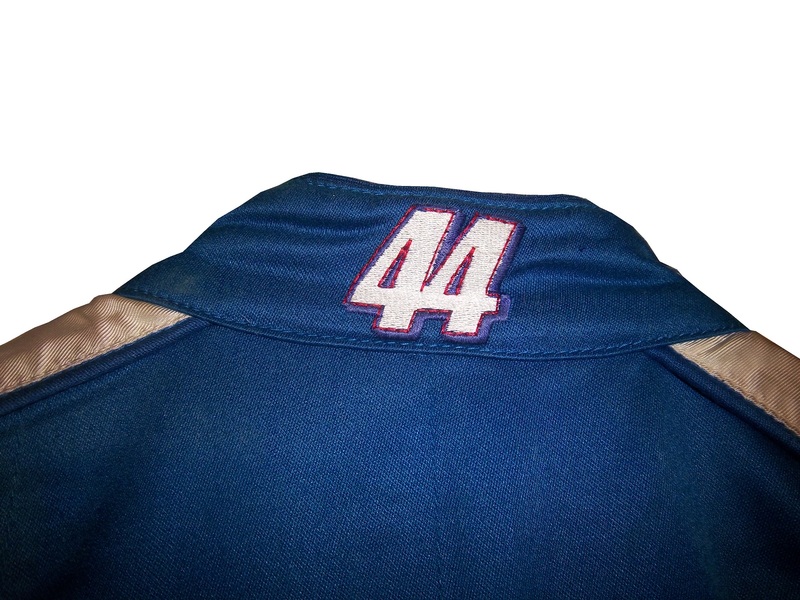 The front torso shows some stains. 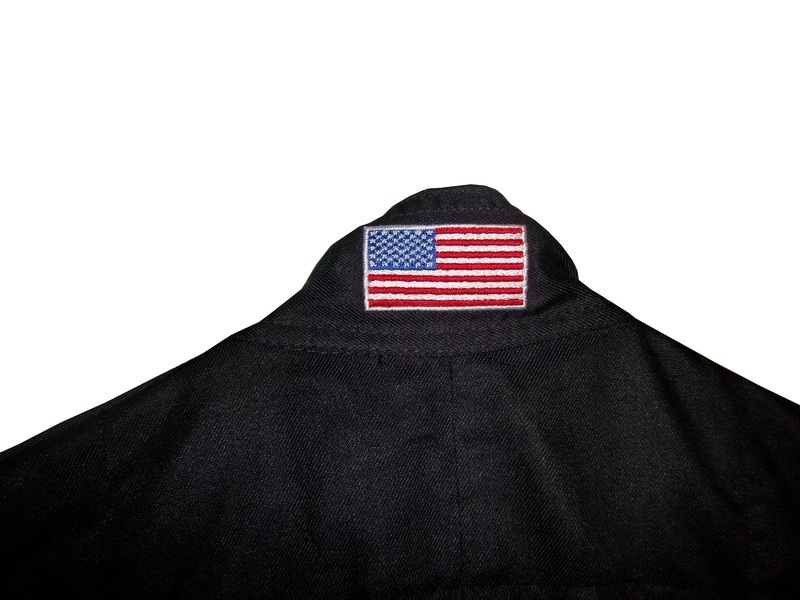 It should be noted that these suits are no longer used, and now Simpson SFI certified suits are currently in use. And while the suit has its short comings it is still a very attractive item. I plan on doing the RPDE in the very near future. 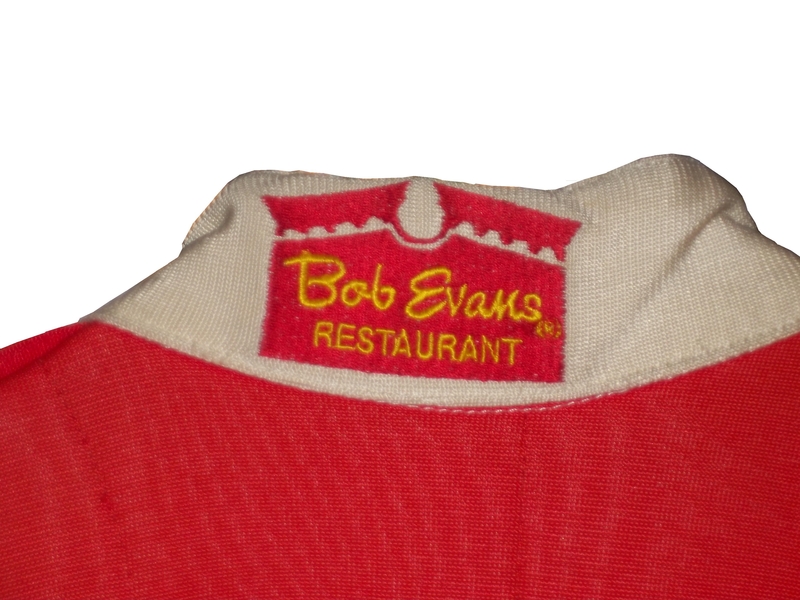 Neck Backs…A Hotbed for Unique Customizations. 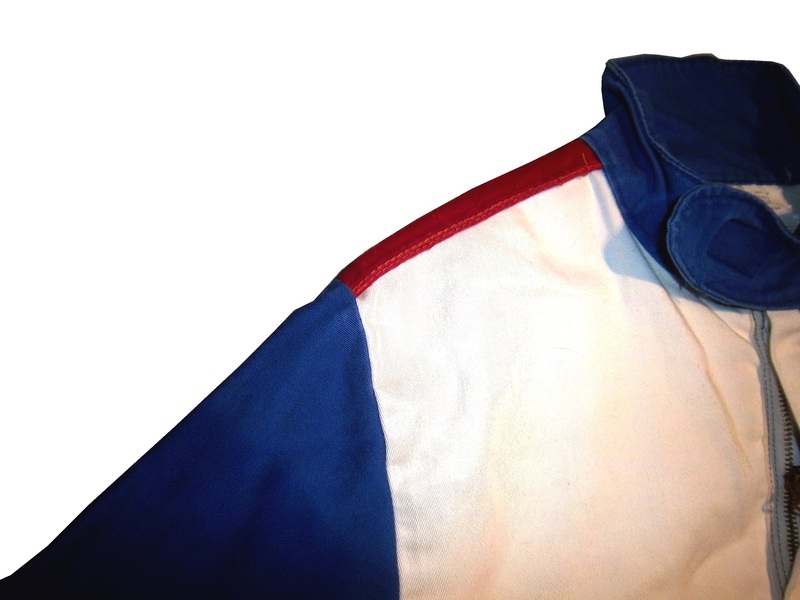 but the back of the neck is a unique place for customizations. 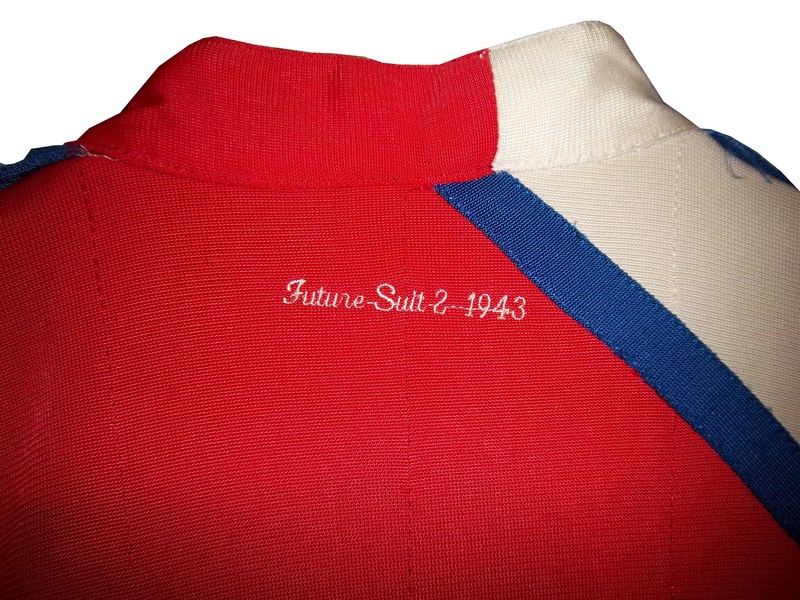 The designs that are placed on the back of the neck are as unique as the driver themselves. 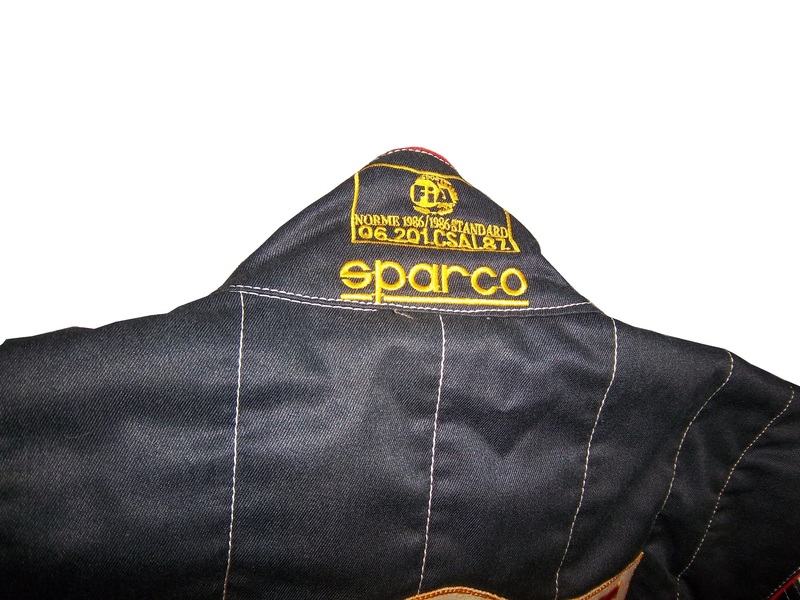 I’ve gone at length to discuss the FIA certification which is frequently sewn into the back of the neck. 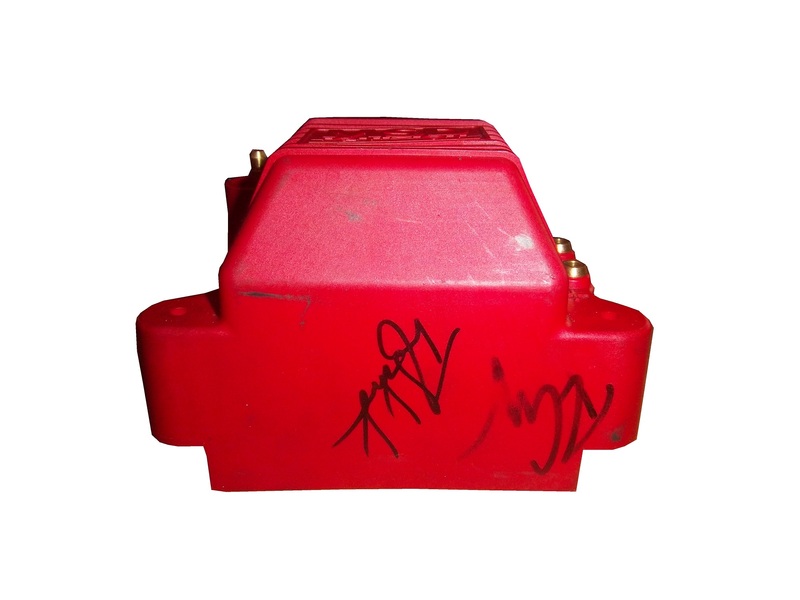 This is a prominent feature in Formula 1 and IndyCar. That is standard issue, so no real need to comment on it any more. 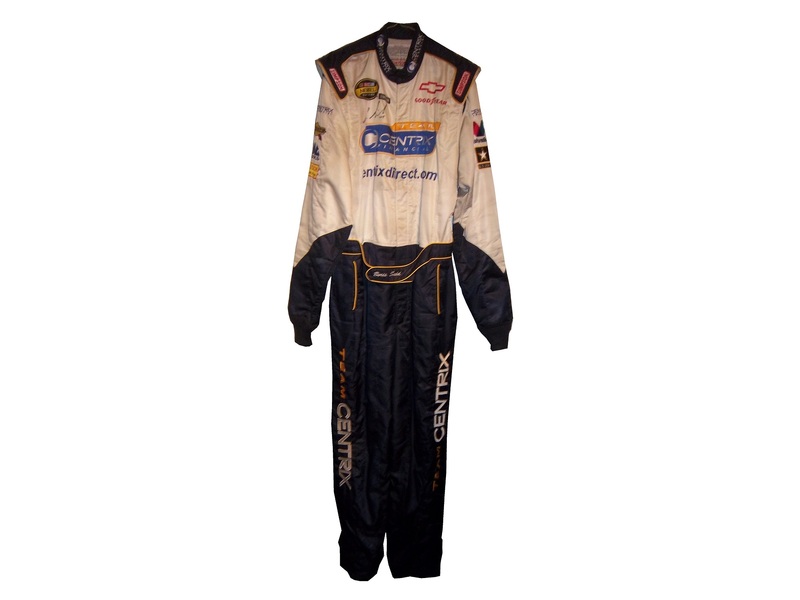 and this Joey Miller Craftsman Truck Series suit from 2005. 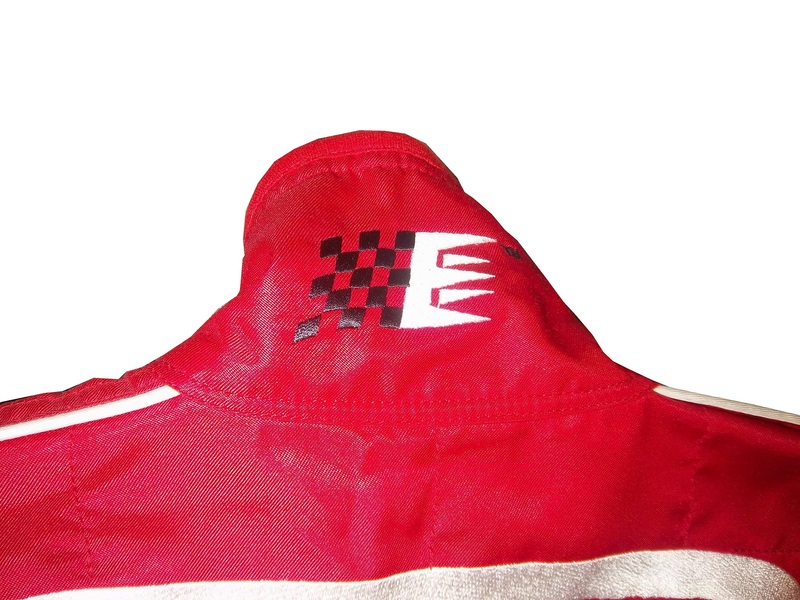 This Kasey Kahne suit has the Evernham Motorsports logo sewn into the back of the neck. 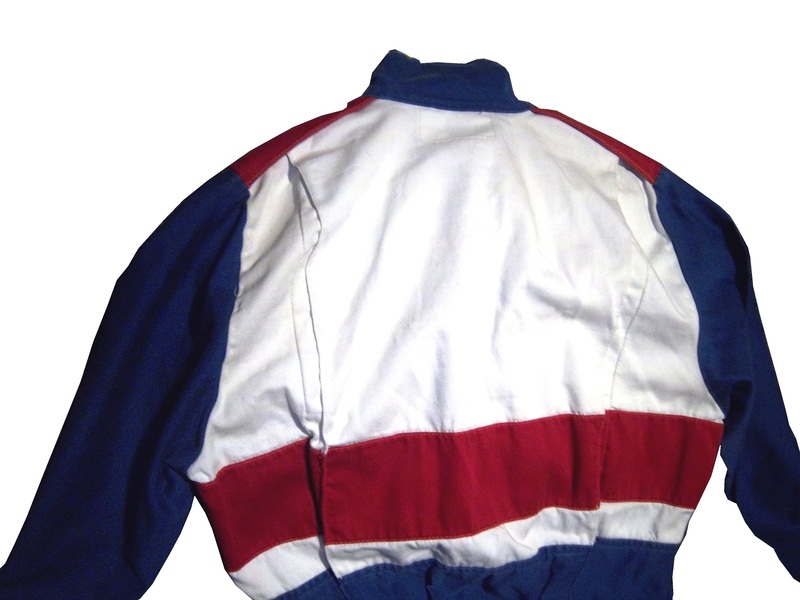 And Roger Penske likes to have the American Flag on the back of the neck of his suits, as evidenced by this David Stremme suit from 2009.
and this Stevie Reeves example, again from 1997. But for my money, the personal customizations are more fun when they are as unique as the driver is. 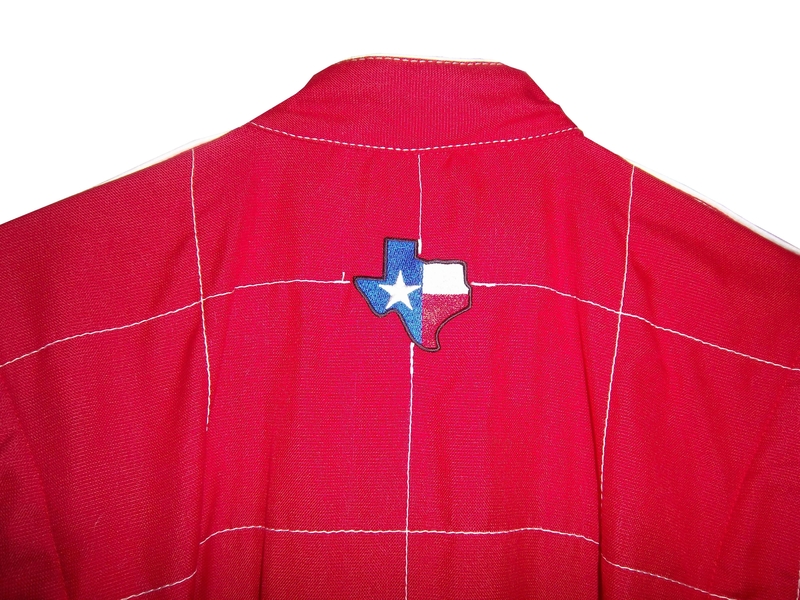 In this Terry Labonte suit, Terry has added a Texas logo. My favorite customization is from a Boris Said suit from 2005. Said has added a Boris Badenov design to the back of his neck. It’s the little things that make a suit personal, and these are some of those little things. 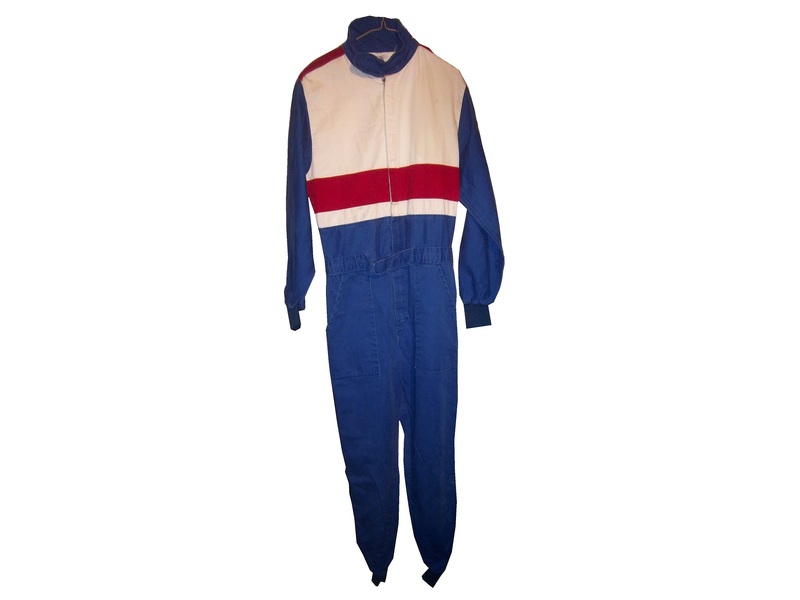 Who says a driver suit can’t be fun. 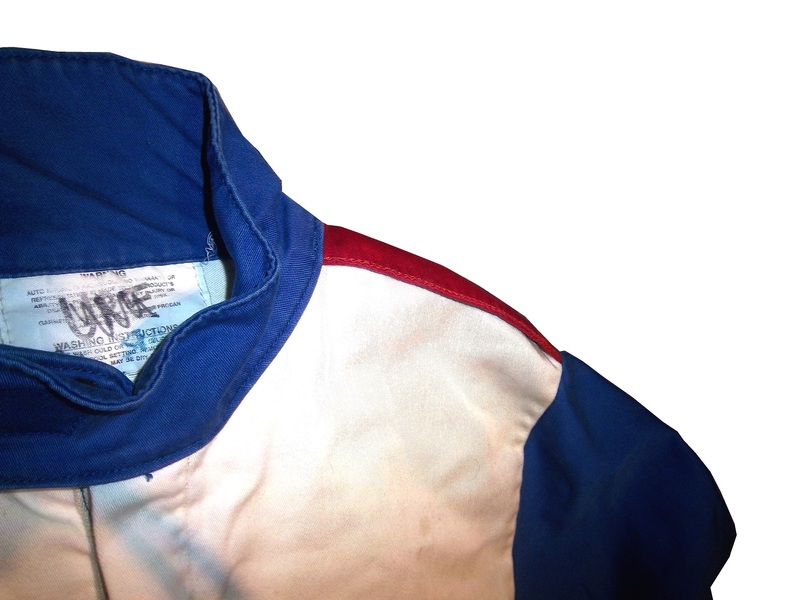 And of course, it goes without saying that the neck is frequently left blank, as exampled by this Nort Northam suit from 1988. Kyle Busch #18 Interstate Batteries All Battery Center Toyota Camry Now THIS is what an Interstate Batteries scheme should be! The classic dark green, gold and white color scheme is amazing, and the design is simple yet very attractive. Giving this scheme an A+ is not saying enough about how great this scheme is! JJ Yeley #36 Golden Coral Patriotic Chevy SS Another A grade Patriotic scheme. Carl Edwards #99 Subway Ahhvocado Ford Fusion Good color scheme and a simple design. I’m not a fan of avocados on sandwiches, but this is a good solid A scheme. 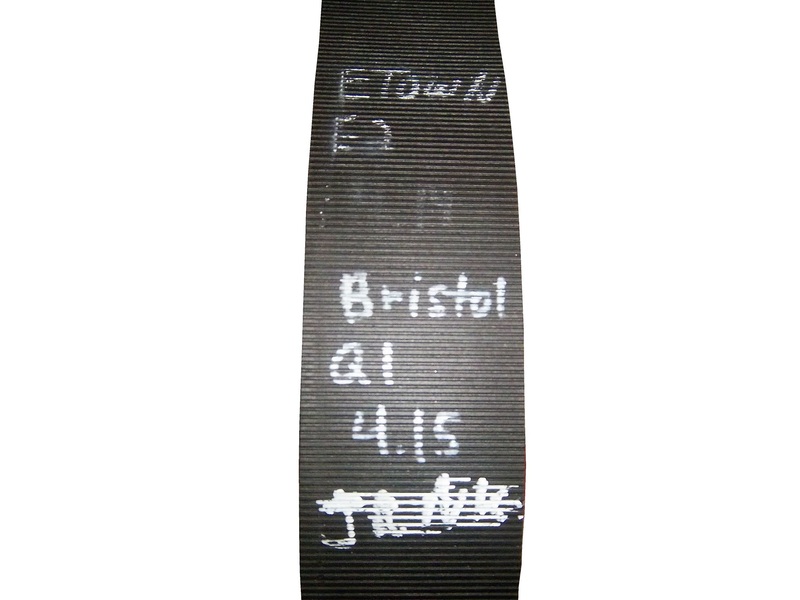 I had a post ready to go concerning collar designs, but I’ve decided to save that for next week. 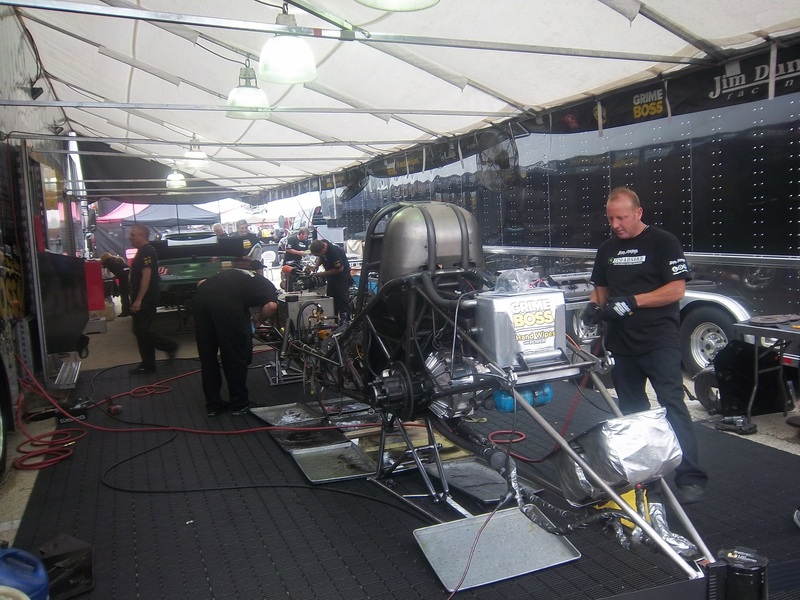 I’m still on vacation, and last Saturday I went to see the 16th annual O’Reilly Auto Parts Route 66 NHRA Nationals presented by Super Start Batteries, in Joliet. I had the chance to get VIP tickets, so I went with Argie, a friend from work, and some of her friends, and took the chance to mix business with pleasure. 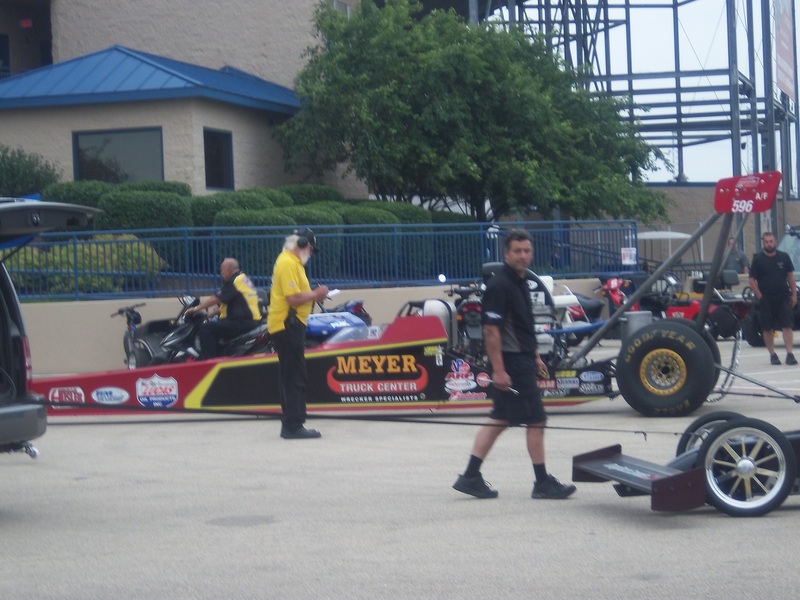 It was a mixture of Mello Yello Drag Racing Series regulars, and some minor league drivers, but it was fun. 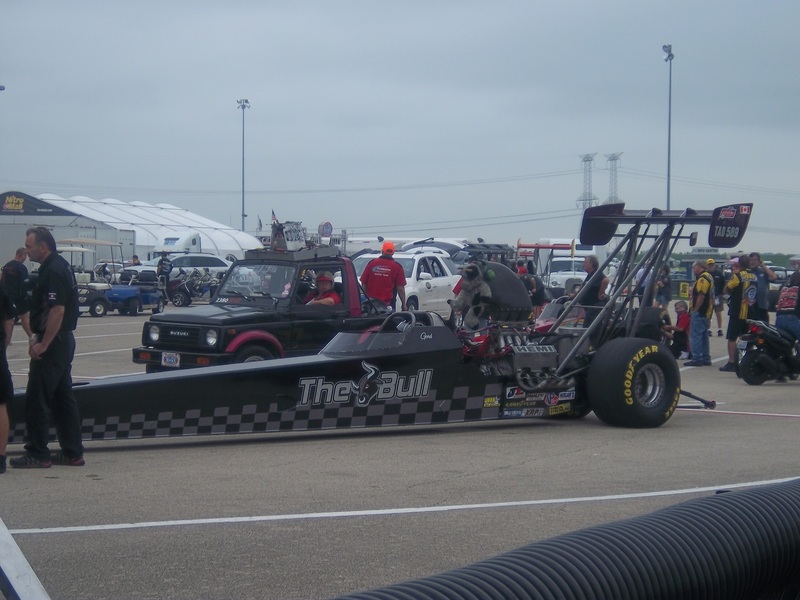 The first thing I learned was how loud these cars really are. 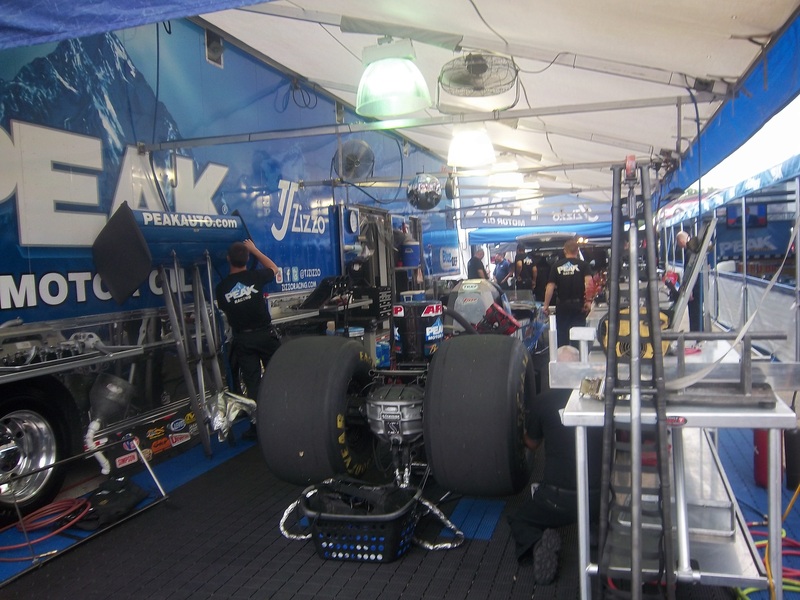 I’ve been to NASCAR races, and I’ve heard the engines running, but NHRA engines are so much louder than I had thought. For a while, I was standing in the spectator area on track level, and as they warmed up, you felt the vibrations of the engine. I’m standing about 75 feet away from the starting line, and when they went by, you felt it in every part of your body, a split second after they passed you. Needless to say, it was AWESOME! 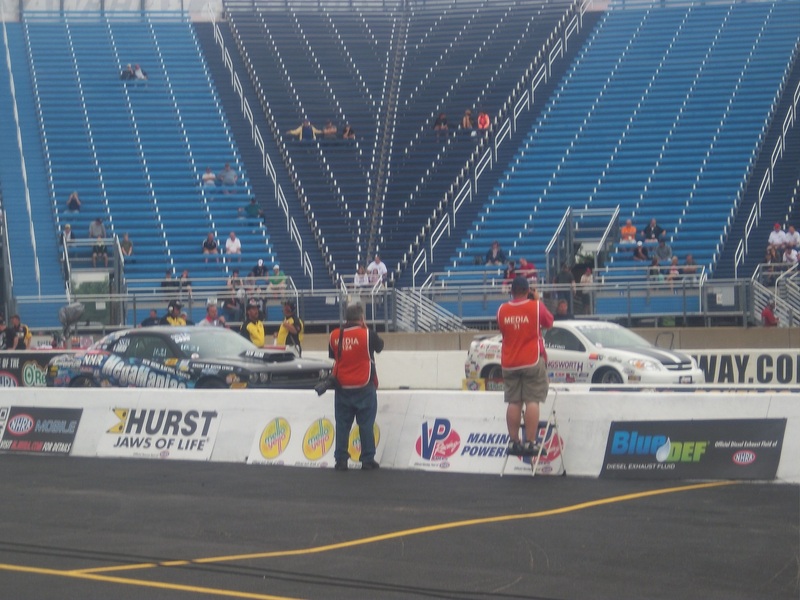 One thing I did enjoy was checking out the different kinds of cars, from top fuel dragsters, to super stocks, to funny cars, The scoreboard tells the fans who won, and what their times and speeds were, each side having its own scoreboard with lights around the sponsor logo to tell you who won. 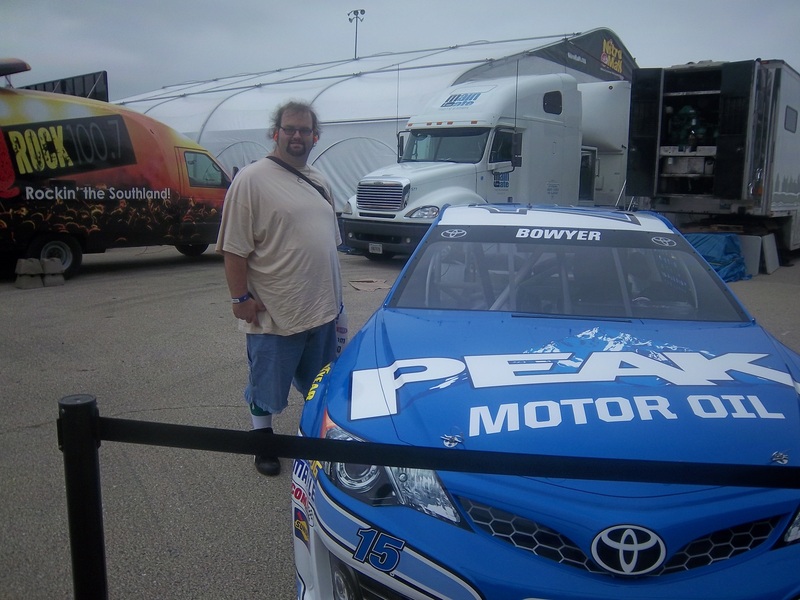 I also checked out the tires on these cars, and man, they are huge! They look like they are twice the size of NASCAR tires. 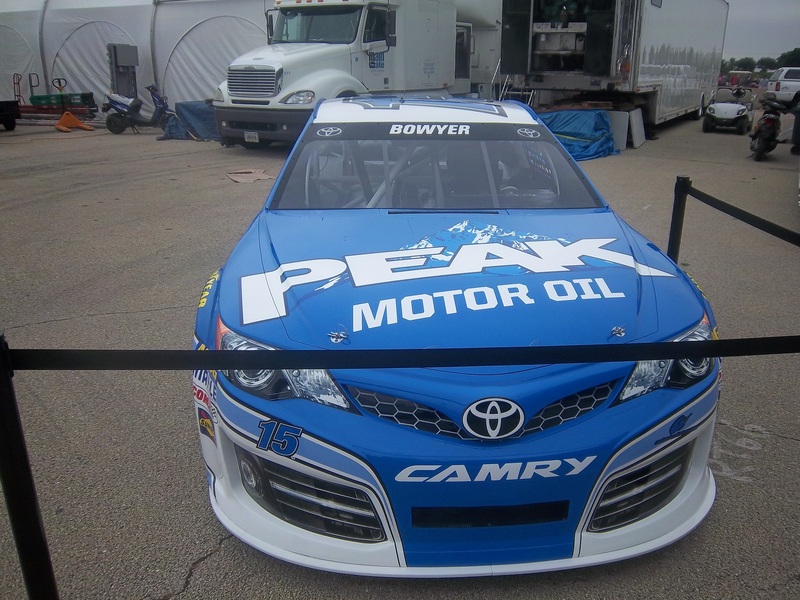 Speaking of which, I got a chance to check out the new Gen 6 Sprint Cup car, as Clint Bowyer’s Toyota Camry show car made an appearance…it looks amazing! 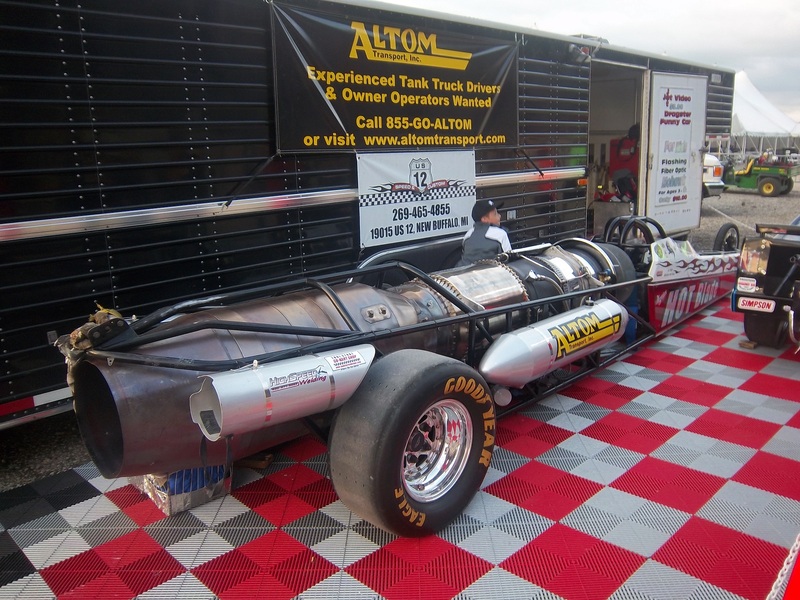 They even had a jet dragster, but I didn’t get to see it on the track…oh well. One of the fun things about these events is that you can check out the pit area, so I did, checked out all sorts of cars, and the various equipment and stages of preparation and equipment used in them. 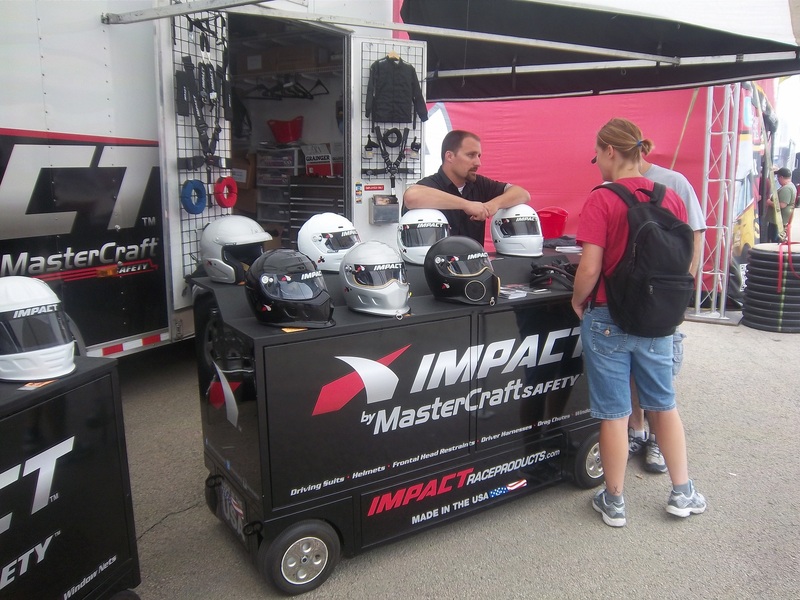 Impact Racing had a booth there, and they had the various designs of helmets sold for race use. 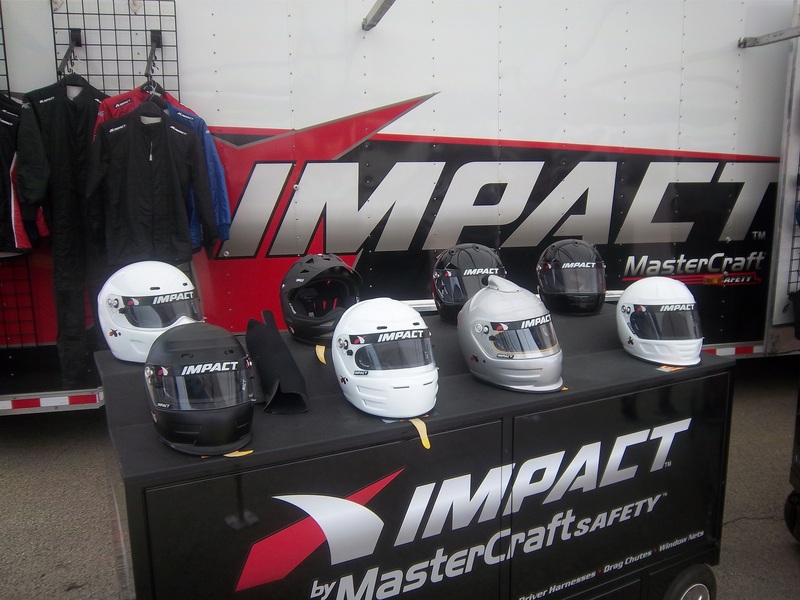 Aside from NASCAR, IndyCar and motocross designs, they had drag racing helmets. 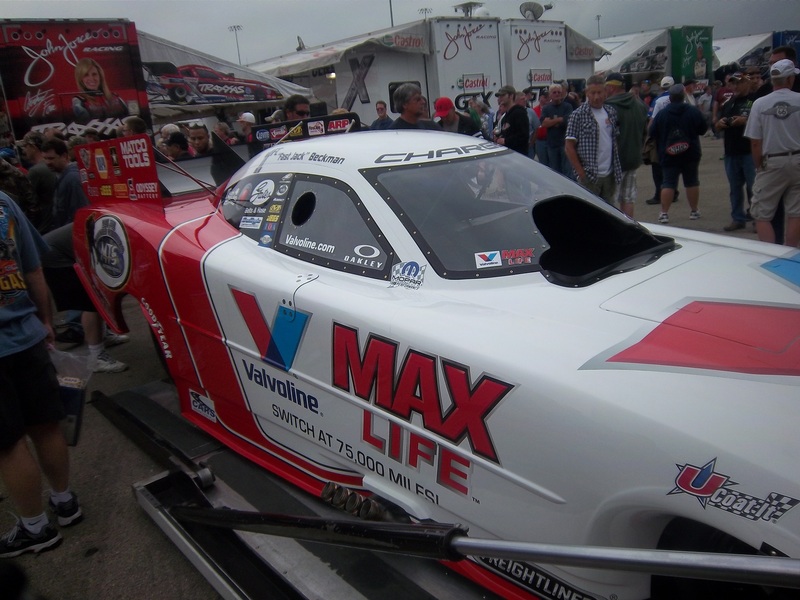 Drag racing helmets feature a visor design similar to wrap-around sunglasses. 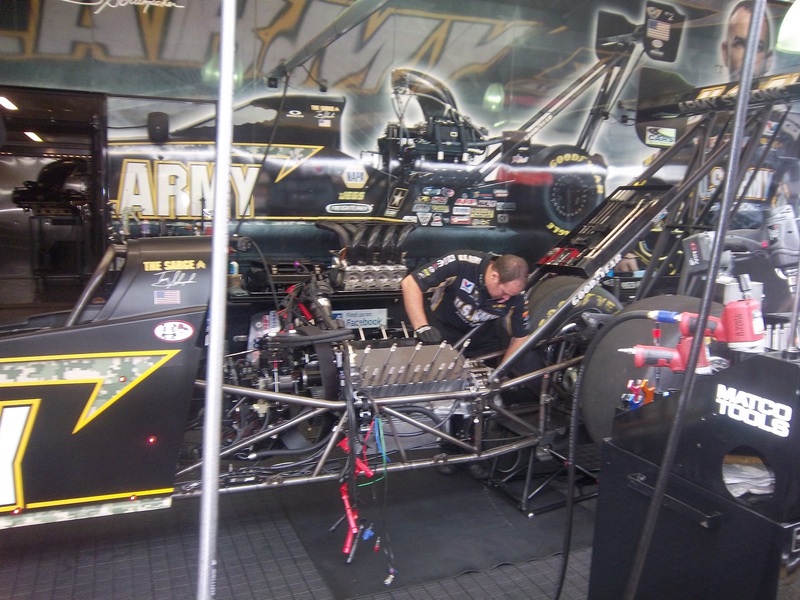 Top fuel and funny cars have their own designs, with funny car having an air filer, since the nitro-methane engine sits in front of the driver, instead of behind, like in a top fuel dragster. 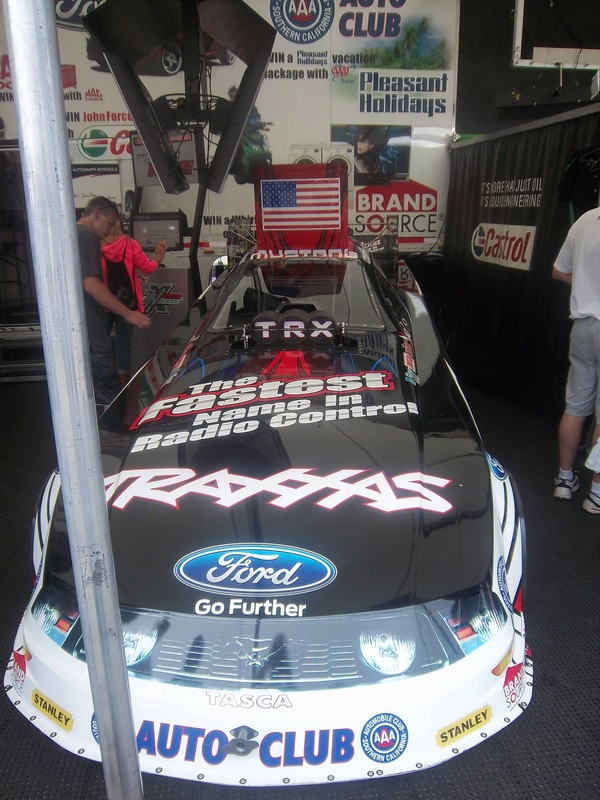 Many of the teams sell off equipment from the cars after the various events are done, and I took full advantage, acquiring a timing belt from Bob Tasca’s Motorcraft Funny car, this one used in his first qualifying session at the Ford Thunder Valley Nationals in Bristol Tennessee. 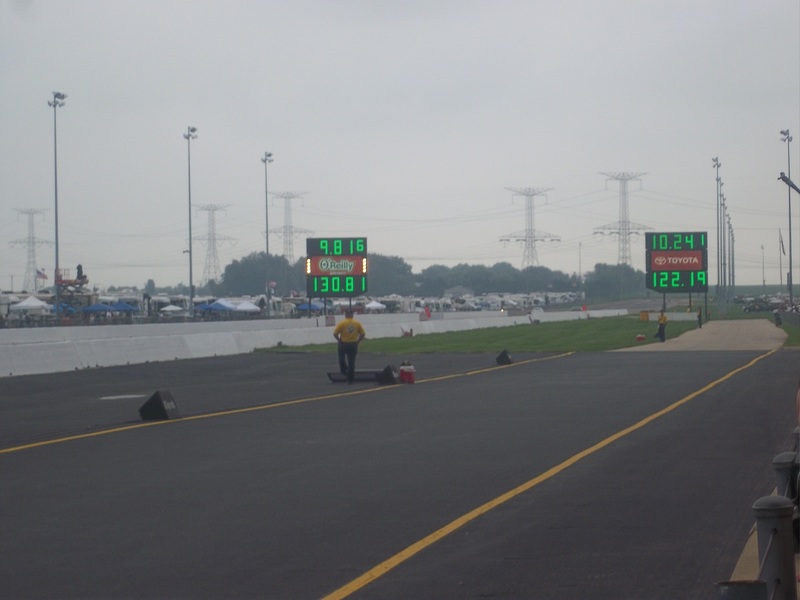 This run he had a 4.15 second, 306 MPH run. This thing is HUGE, measuring over 64 inches in circumference and 3 inches across. 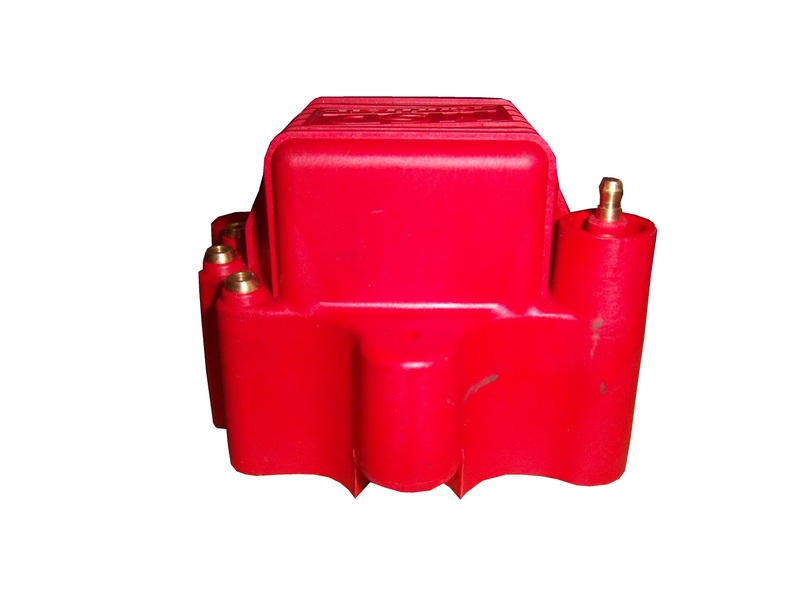 As well as an ignition coil and a spark plug from Morgan Lucas Racing. 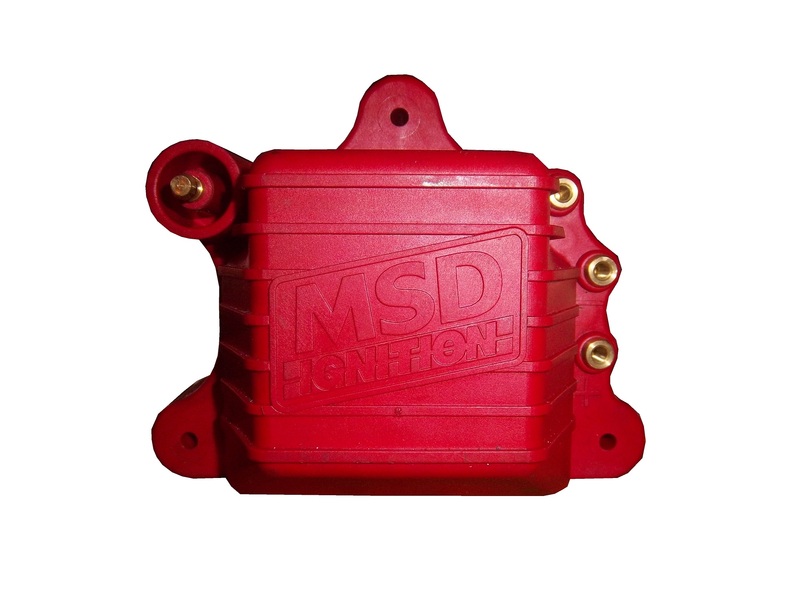 Ignition coils are used to turn on cars in general, but this MSD 8142 is designed to fire up these 8000 horsepower engines, which need a lot of electricity to start and operate. 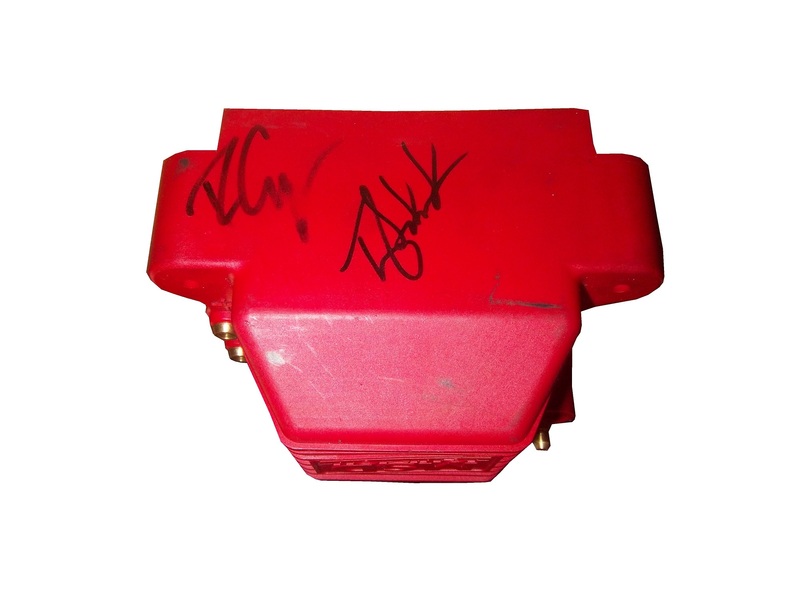 I was fortunate enough to have Tony Schumacher and Ron Capps autograph it in person. 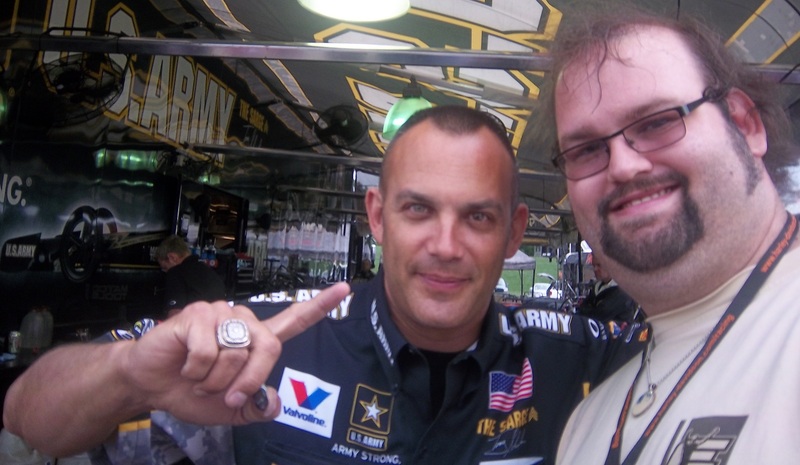 Afterwards, I was able to get a photo with him, and got to watch the engine test. This video looks tame, but unless you see it in person, you don’t have any idea how loud it really is, and I was 15 feet away when I shot that video! Then I had dinner, and called it a day. I had a great time, and I will go back any chance I get! 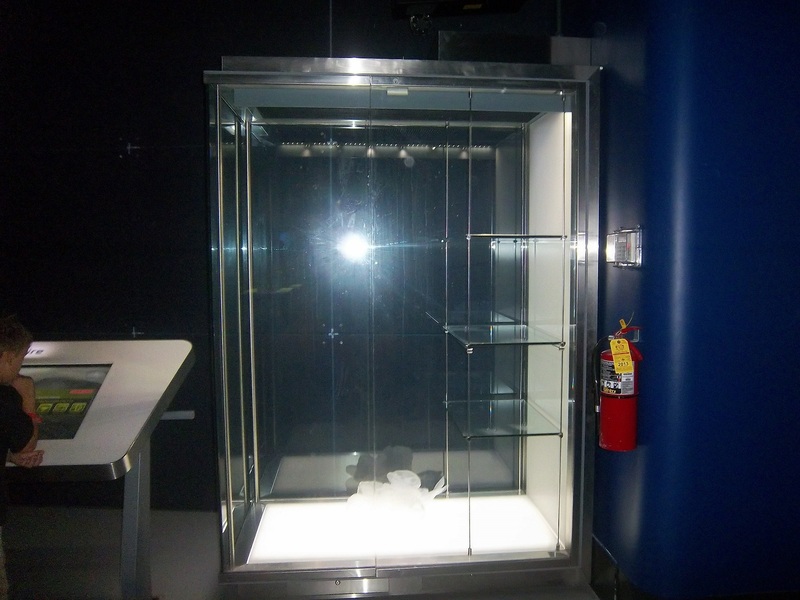 In other news, I went back to the Museum of Science and Industry, and I went to the Jeff Gordon suit exhibit, and was shocked to see this: THE ENTIRE DISPLAY had been emptied out of the display case. At first I didn’t know what had happened, so I asked at the information desk. They, in turn, told me that pipes located above the display had been leaking, and that the items had been removed. I hope that when the display is fixed, the issues I discussed in a previous blog will have been fixed, I will keep you posted. 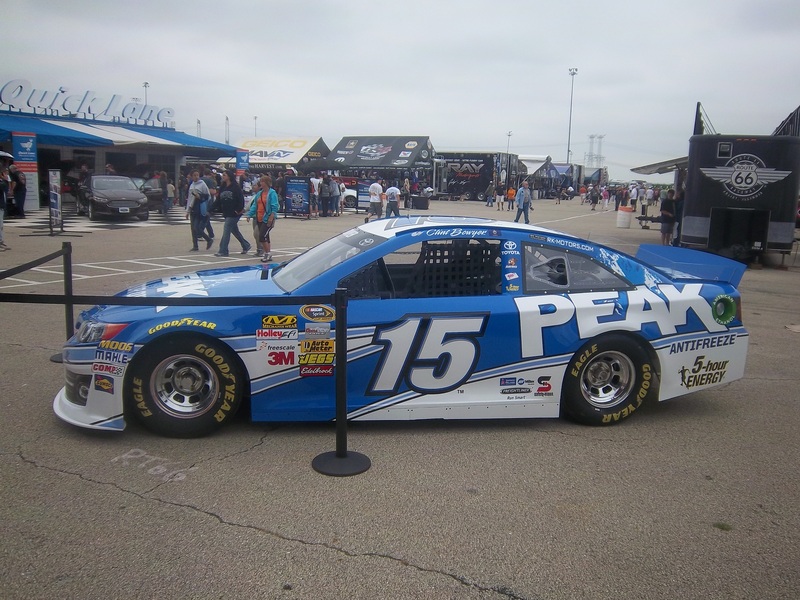 And since I’m here, Let’s talk paint schemes…shall we? Jamie McMurray #1 Hellmann’s 100th Anniversary Chevy SS The yellow or green on the contingency decals is pointless, and it takes away from what is a very solid scheme, with simple design and great color. I give it a B+, almost an A, just not enough. Martin Truex Jr. #56 NAPA Batteries/Get Back and Give Back Toyota Camry Another example of why most teams only USE ONE COLOR AND DESIGN SCHEME! The nose features BDU digital camouflage in light and dark green, which works well. 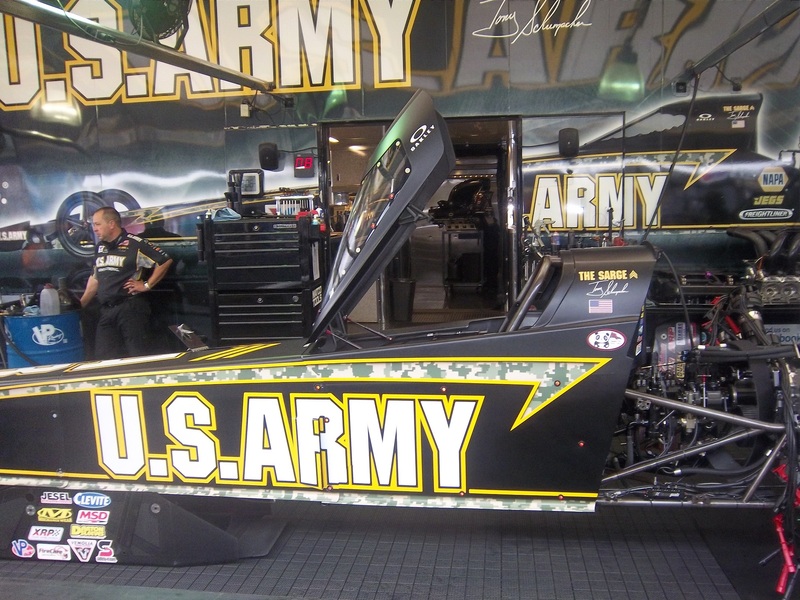 The doors feature Truex’s normal scheme, again good color and design, and the back features a blue/black digital camouflage, again which would work well by itself. The problem is that the combination of the three make for an awful look. This scheme is one of the worst so far this year, and it earns the F- grade it deserves. I fully support our Armed Forces, but this scheme is horrible! Carl Edwards #99 UPS Ford Fusion I know I covered this scheme in a previous post, but this photo illustrates why I hate UPS as a car sponsor. No matter what, UPS cars have one thing in common, and that is that the driver suit can look really good, whereas the car will look awful. In this case, the car has pointless designs and needlessly added colors, whereas the driver suit is simple and attractive. So my previous grade of D- still applies. 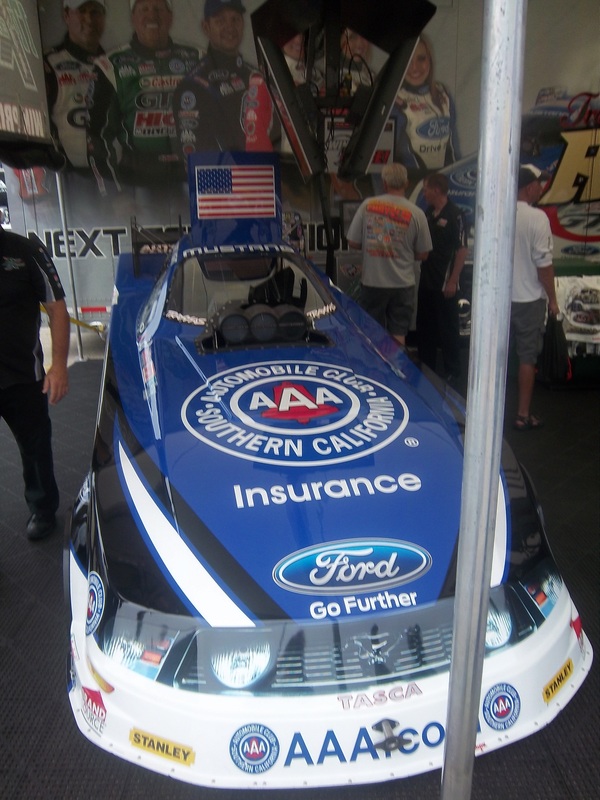 And finally, while I don’t normally do Nationwide paint schemes anymore, I had to do this one. Kurt Busch has had a throwback at Talladega reminiscent of Neil Bonnett’s Country Time scheme from the 1980’s, and last night, he had had an amazing scheme taken from Days of Thunder…I love that scheme because I love the movie. The boxy design of the Camaro works well with the scheme, as it is much similar to the design of the Lumina. Keep it up Kurt!